The Choir of St John's is a voluntary group of around 25 mixed S.A.T.B. voices covering a range of ages and musical backgrounds. The choir has a tradition of long-serving members together with newer singers who join each year. 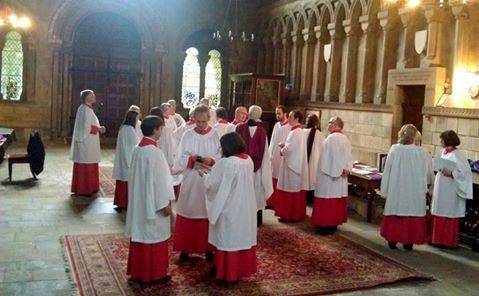 When singing in church, the Choir is normally split in the Anglican tradition of Cantoris and Decani and wears red cassocks and white surplices. The choir is also available for weddings, funerals and other occasions, both in St John's and elsewhere. Rehearsals take place in the church hall on Thursday evenings from 7.30pm - 9.15pm in preparation for Sunday services and other events, followed by drinks downstairs. Other occasional practices may also take place. The choir regularly gets out of the St John's choir stalls, either to perform a concert in the church or to go on tour. Choir members enjoy a very active (optional!) social life both in and outside the life of St John's. This includes events such as the annual party, Christmas dinner and 'retreat' to the Cathedral of the Isles. On Thursday and Sunday evenings, Choir members can usually be found enjoying a post-choral drink or three in the vaults of the church or a local hostelry. The choir is currently recruiting for all SATB voices. If you would are interested in joining, please contact the Director of Music Stephen Doughty.